Google announced this week that its testing a payment program called Hands Free that lets users pay for goods without having to reach into their pockets. The idea behind the program is that anyone can walk in to a store, find what they want and head to the register, requiring only their face and a moments conversation to purchase something. Hands Free is in a limited pilot program at select stores in the Silicon Valley area. Google said that it uses a variety of sensors in a users smartphone, including Bluetooth and WiFi, to detect when shoppers are in a particular store. 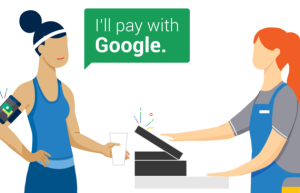 When at the cash register, the users simply have to say, Ill pay with Google and give their initials to the cashier. The store employee checks the initials and a picture that users have uploaded to their payment accounts to verify that they are who they claim to be. According to the companys website, stores never get access to consumers full credit card information. Users also get a notification when their Hands Free account has been used, as a fraud-prevention measure. The program is being tested at McDonalds and Papa Johns locations in Californias southern Bay Area. Google released a video illustrating how the process works, showing a woman buying goods with little more than a smile and some magic words. The promotional video from Google has strong echoes of the way Apple first promoted its Apple Pay program, highlighting that the current ways we pay cash, card or the dreaded check are not as convenient as they could be. Why, the video illustrates, do we still have to fumble around with things in our hands to pay? Its true that it can be annoying to dig through pockets or purses for a wallet, and that it often seems like the payment process should be a lot smoother than it is. With the advent of chipped credit cards, some shoppers may also like the appeal of paying by phone rather than waiting for the slightly longer transaction times. But the real push toward mobile payments has come from companies that see the appeal of controlling mobile payments. In addition to payment-focused start-ups and traditional credit card companies, tech firms such as Samsung, Amazon and Apple have turned to mobile payments as an opportunity to raise their profile with customers and become more indispensable in their daily lives. Samsung has been aggressively advertising its payment system on a television commercial starring comedian Hannibal Buress that highlights the fact that many existing credit card machines can process the companys payment technology. Despite that push, Apple Pay has the highest recognition when it comes to mobile payments, since the feature is built into every model of the companys flagship smartphone, from the iPhone 6 and beyond. Piper Jaffray recently found that Apples payment system is by far the most requested by merchants. The survey, as reported by Apple Insider, showed that Apple handily beat Samsung Pay, PayPal and Googles Android Pay which lets users pay with their smartphones as the top choice (44 percent) when analysts asked software vendors which systems are most requested. The jury is out on how popular mobile payments are among consumers. A recent survey of 580 iPhone users by the consulting firm First Analysis found that just 20 percent had reported using Apple Pay at least once since December, with just 15 percent saying that they used it often. Those figures were slightly lower compared with the survey the firm conducted last year. The landscape, however, is a competitive one for businesses. Results from Crone Consulting, published Tuesday by Bloomberg, showed that Apple Pay has 12 million active monthly users, compared with 5 million each for Samsung Pay and Android Pay. Although that puts Apple well ahead of rivals, its worth remembering that Google and Samsung launched their products nearly a year after Apple did and have grown quickly. Hands Free demonstrates that Google has larger plans in this space. The company said its also planning a program that works solely based on matching your Google Hands Free picture with an image of your face taken at the register. Images and data from the Hands Free in-store camera are deleted immediately, cant be accessed by the store, and is not sent to or saved to Google servers, the company said.